Dominique Laffin had several small jobs before she started acting. She married the actor Yves Dautin and in 1973 they had a daughter, the politician Clémentine Autain. She made her first movie "La nuit, tous les chats sont gris" in 1977. She was praised for her part in Jacques Doillon's "La Femme qui pleure" (1979). It earned her a nomination for a César award nomination, but the César was won by Miou-Miou. In 1985 she suddenly died of a heart attack in her appartment. It was believed that she committed suicide by taking an overdosis of pills and alcohol. 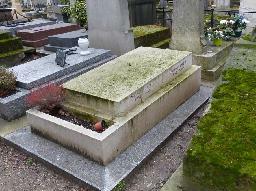 The grave of Dominique Laffin at the Cimetière Montmartre, Paris.